DALLAS, TX--(Marketwired - Dec 15, 2015) - New research from Parks Associates indicates smart watch adoption has nearly doubled, from 4% of U.S. broadband households at the start of 2014 to 7% now, with 10% planning to buy a smart watch by midyear 2016. The research firm will discuss its latest consumer research on wearables, the smart home, and the connected consumer at CONNECTIONS™ Summit: IoT, Entertainment, and the Connected Consumer at CES® 2016, January 6-7 in Las Vegas. "The wearables market is growing strong, and their unique form factors will help drives sales for the holidays," said Harry Wang, Director, Health and Mobile Product Research, Parks Associates. "Smart watches are particularly popular among broadband households with children. 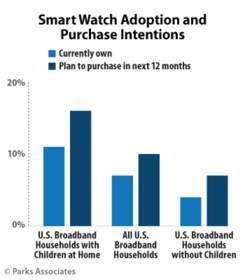 Eleven percent of U.S. broadband households with children have a smart watch, and 16% plan to buy one by midyear 2016. The smart watch has significant connected health applications, but family-oriented use cases will also help grow and maintain the device's popularity." Parks Associates notes that design, fashion, and personalization are also important elements as smart watch vendors push for greater mainstream adoption of smart watches. The research firm will address how wearable innovations are impacting multiple sectors within the connected home, including health-based services and smart home systems, during the session "Wearables: Healthcare, IoT, and Smart Home Use Cases" on January 6 at 10:30-11:45 a.m.
"The pace of adoption, and unfortunately abandonment, of wearables is staggering," said Frank Napoleon, Director - Monitoring Innovations, Intel-GE Care Innovations. "Like all new technology, finding the use case that drives and sustains adoption is key. Care Innovations is focused on understanding how to sustain engagement and discovering what combination of data points -- from wearables, vital signs, claims, and consumer data -- holds the most promise to create new proactive care plans to head off deterioration in health." CONNECTIONS™ Summit: IoT, Entertainment, and the Connected Consumer will be held in the Venetian Hotel, Level 4, Room Marcello 4501. Sponsors include Cirrent, F-Secure, Affinegy, AirTies, Alarm.com, Carrier, CSS Corp, EVRYTHNG, Greenwave Systems, Icontrol Networks, MivaTek, NXP, PlumChoice, Radialpoint, ROC-Connect, Support.com, ULE Alliance, Vivint, WeatherBug Home, and Zonoff. For information on CONNECTIONS™ Summit, contact sales@parksassociates.com or call 972-490-1113. Follow the event on Twitter at @CONN_Summit and #CONNSummit16. During CES, visit Parks Associates at booth # 70,959 in the Sands. Registration for CES is at www.cesweb.org. The 2016 CONNECTIONS™ Summit will take place January 6-7 during CES, which runs January 6-9 in Las Vegas. Follow the event on Twitter at @CONN_Summit. For information about CONNECTIONS™, contact sales@parksassociates.com or call 972-490-1113 or visit www.connectionssummit.com.